Is your website welcoming to new visitors? It needs to be welcoming as your prospective customers will likely visit your website long before they ever walk into your reception. The welcome they receive at your website will create their first impression of your company. If you want to roll out the red carpet ensure your website has the following five characteristics. I’ve included five top tips that you can start to action straight away. 1. A Website that loads fast . . .
A website visitor won’t be as committed to waiting as a visitor standing in your reception. If your website takes too long to load your visitors will simply hit “back” and go somewhere else. You only have a few seconds to grab a visitor’s attention. Also, it’s not just visitors who hate slow websites. Google penalises websites in their rankings if they don’t load quickly as it means they offer a bad user experience. Top Tip: Test your website speed with Google’s PageSpeed Insights tool. 2. A Personal welcome . . . Unfortunately it’s not possible to have a receptionist waiting on your website ready to give every website visitor a warm welcome, so what else can you do? Avoid the common small business website mistakes and ensure that your header tagline clearly tells the reader what you do at the top of every page. Remember that not every new visitor will land on your homepage. Pick a welcome that suits your target market but remember that just saying “Welcome” at the start of your homepage text isn’t really that welcoming. Top Tip: Add a video to your homepage that visitors can click on to get a personal welcome from you. Keep the video short, around a minute and depending on your audience you might not want it to autoplay – especially if they are likely to be sharing an office. 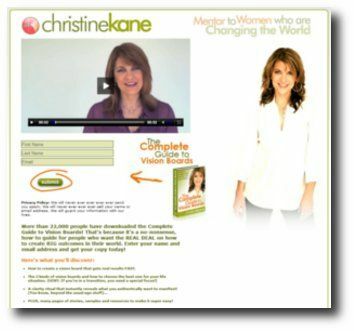 You can see a great example of a personal welcoming video on Christine Kane’s website. 3. A Clear place to start . . . When you wait in a reception there is often reading material on the coffee table, perhaps even television news on a flat screen. As soon as you’ve welcomed a new visitor to your website you want to start engaging the reader and showing the very best of what you have to offer. You wouldn’t leave a visitor wandering around your office building or showroom so why do it when they visit your website? Top Tip: Create a “New Visitor? Start Here >>” page which lays out your best content and shows the new visitor what they should read first. 4. A Useful gift . . . In a physical reception visitors would be offered coffee, perhaps even a couple of biscuits while they wait. What can you offer new website visitors? Offer something that will be of great interest, relevance and that you know will be useful. An accountant might offer a guide on how to keep track of invoices and receipts, an IT expert could offer a set of keyboard shortcuts or an eBook on how to get the best performance from your computer. Introduce your free guide or other gift content at the bottom of your “Start Here” page and explain the benefits of reading it. Top Tip: Offer your free guide in return for the visitors email address so you can add them to your small business email marketing list and send them your future relevant content by email. I offer a copy of my free eBook “Focused Marketing” to anyone who signs up to receive my future content by email. It contains actionable information you can use straight away to attract your perfect customers – if you don’t already have a copy please sign up for one at the bottom of this post. 5. A Invite to get to know you . . . Profitable small businesses are based on successful customer relationships. Invite your visitors to get to know you, join you on social networks and contact you through your contact form so you can start to get to know them and build conversations. You’ll not only begin building valuable relationships but you’ll learn more about your customers problems and issues and in turn be able to be more relevant in offering them solutions. Top Tip: Add links to your social networks on your “Start Here” page and homepage and encourage visitors to connect with you and get in touch with questions or comments. The internet is filled with millions of websites, several just like yours from small businesses offering similar products and services. To stand out from the crowd you need to give visitors a fantastic welcome to your website and really roll out the red carpet. Use the top tips listed above to start improving your welcome today. Is there a top tip missing, what would you add? Please join me in the comments for a discussion. Thanks for the mention Robert! 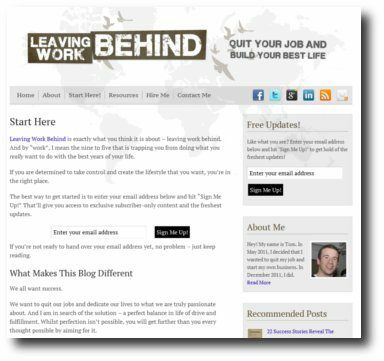 If people want to discover more about how to put together an effective “Start Here” page, they might be interested in checking out this article that I wrote over at WPMU.org a few months back: http://wpmu.org/are-you-losing-visitors-by-omitting-this-key-page-on-your-blog/. You’re welcome Tom, your “Start Here” page is a great example and I really like the way you laid out your “greatest hits”. Your post at WPMU.org is also a very useful resource. Some cracking links and food for thought! Thanks for your feedback and comment! Lots of simple fixes for some of the most repeated issues on small business websites. Yes, it’s amazing how much impact something like a “Start Here” page can make. It’s simple to create but very beneficial and welcoming to a new visitor. Thanks for the feedback and comment Paul! It’s irritating to visit websites that’s taking forever to load. I’d normally leave the website in the middle of “loading”. It’s also be nice to see sites/blogs with very visible social media buttons so that I can easily follow them. Great points James. It doesn’t matter how good the content is if nobody waits around to read it because the website/blog is too slow to load. Thank you very much for the feedback and comment Sian! I’m really glad that the post is helpful.